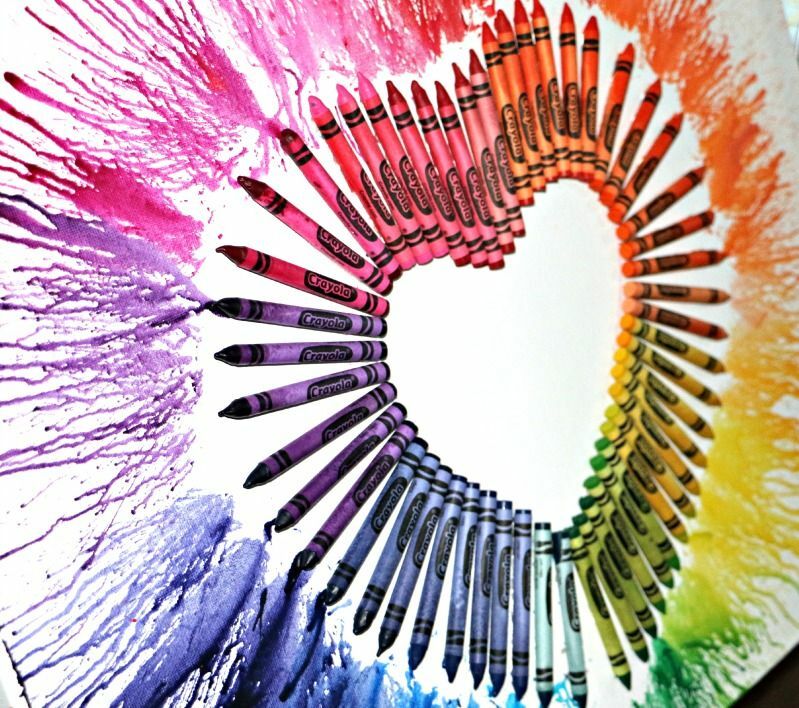 We all have our childhood days when we colored and scribbled with numerous crayons. 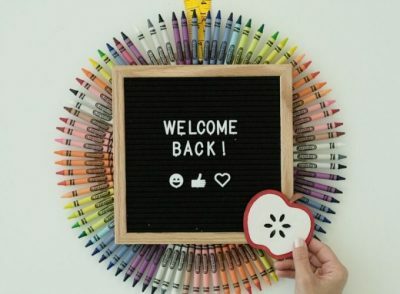 Hundreds of colorful crayons can be used to adorn a wreath along with a chalkboard or other accessories in the center to add your personal message. 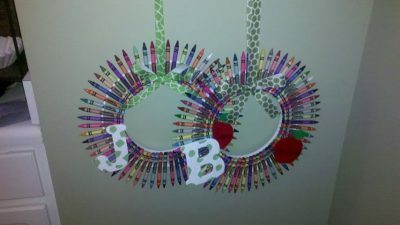 This is a great crafty project for the kids to make during the holiday/Christmas season. 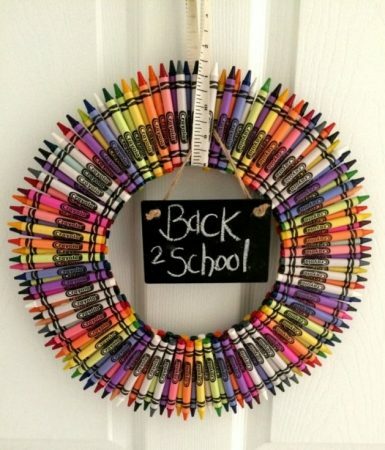 The coolest way of making the walls of your rooms look vibrant would be by creating a lovely wreath out of crayon. This makes a lovely gift for teachers too. 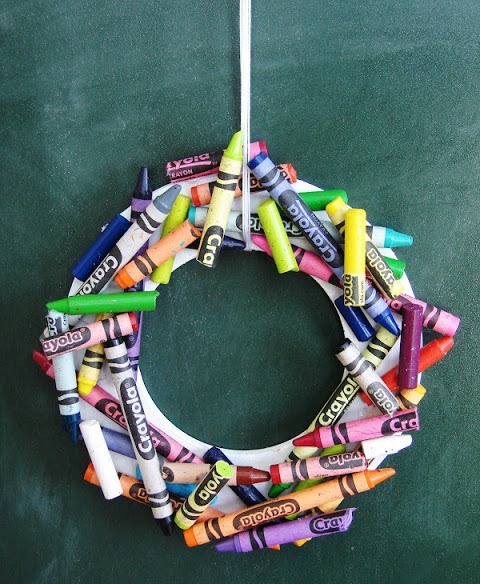 We are sharing some amazing tutorials and DIYs to make a handmade, multi-colored wreath made from crayons. The linked tutorials have step-by-step instructions to guide you well. This is an easy tutorial for kids and preschoolers who love making handmade stuff and try new things. 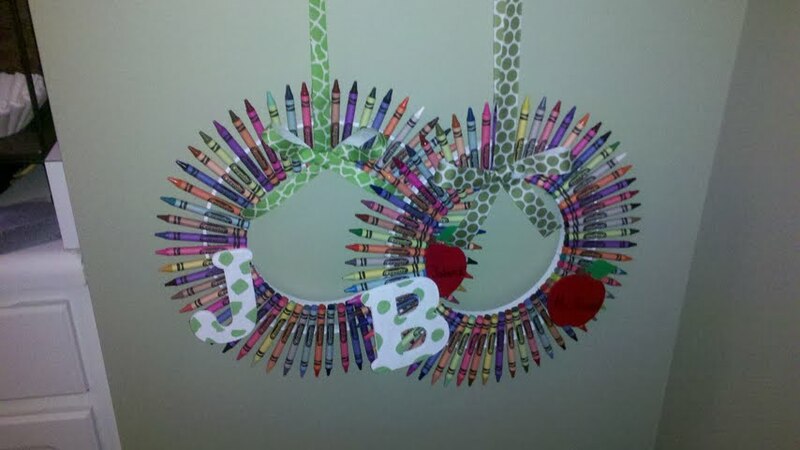 You need an embroidery hoop for this craft, some crayons, and a hot glue gun. An ideal gift for teachers day! This is one of the easiest ways to make a wreath out of crayons. 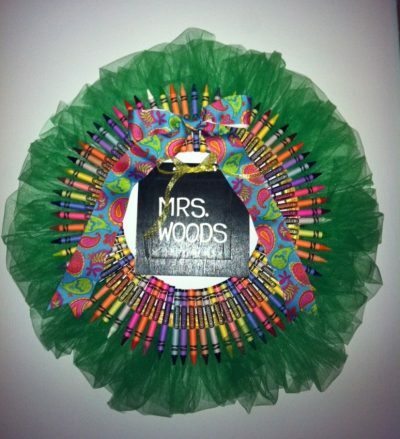 You can add the monograms or name initials to add a personalized touch to it. Grab your set of crayola colors and get creative with some ribbons, colors, and chalkboard. Embellish it with cute cut-outs to give it a classroom themed design. Doing some out-of-the box craft with recycling old colors fascinates me a lot. 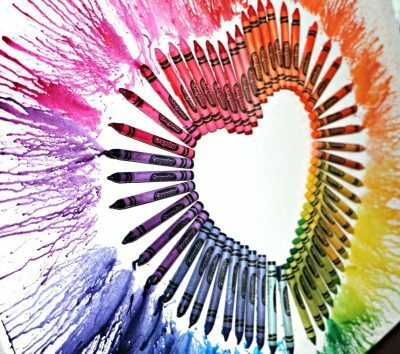 You can get this rainbow shades of melted colors, by using heat from a blow dryer to get this amazing effect. 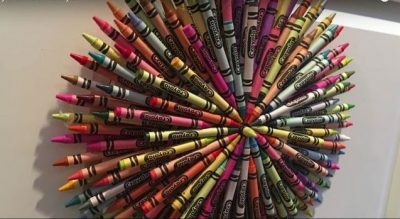 You can easily use old crayons also for this DIY project. 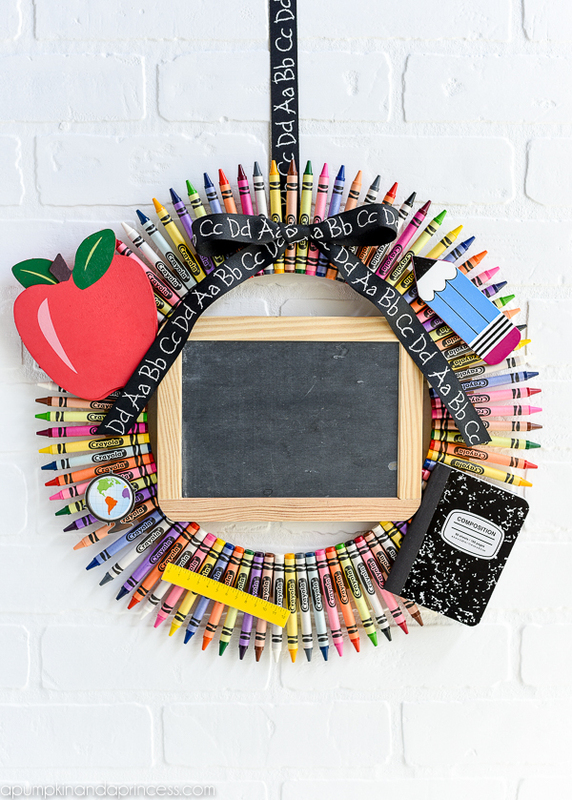 You need the following supplies to make this wreath, 150 Crayons, a hot glue gun, (1) 10″ cake round, (1) 6″ cake round, an old CD, a pipe cleaner, and a paper punch. 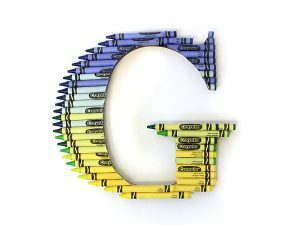 A unique way to make something your children will love to create. Use ribbons, satin bows and more to make this unique wreath made from crayons for Christmas. You can change the colors of the ribbons and give it an interesting look. 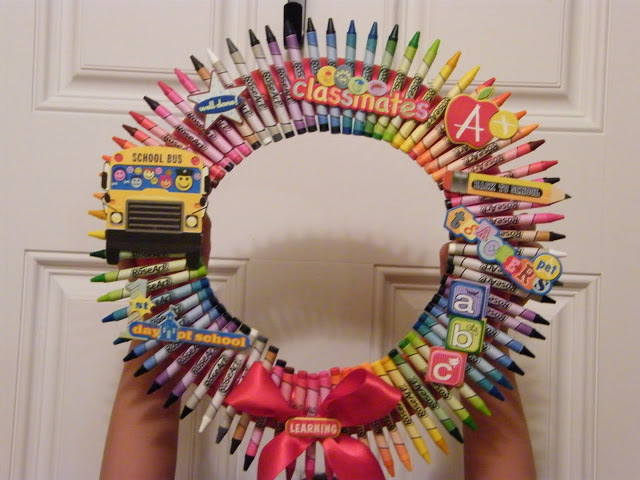 This back to school crayon wreath makes for a perfect teacher appreciation gift craft project anyone can do! 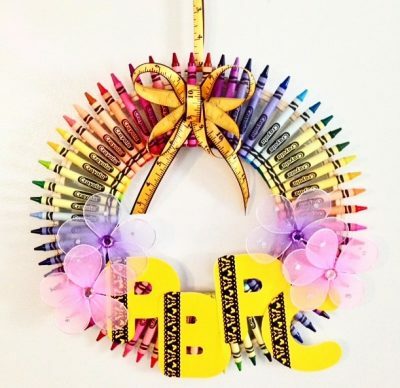 A hanging monogrammed wreath made with ombre shades of crayons will make your child thrilled when he sees his initials on the walls of his room.